It was traditional that each family had a specific pew. In some churches (although not Fahan) the family tended to the gravel beneath their own pew. Below is the plan of Fahan Presbyterian Church from 18th December 1926. The seats are numbered anti clockwise from the rear right hand corner. No. 1 to 17 up the right hand side starting at the back. No. 18 to 34 down the left hand side from the front to the rear left hand back corner. No. 35 to 47 is up the centre from the back to the front. The pulpit is at the front centre. 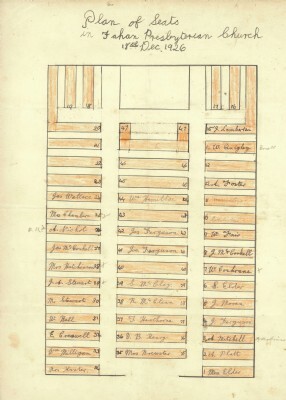 An area for a choir and/ or an organ appears to have been constructed where seat 48 had been located in 1890/ 1900 plan of pews/ seats.